May 6, 2016: In our latest millet planning meetings, we have been discussing the development of a millet-based product to sell. Stay tuned for the Millet Exhibit late this summer where we may have prototypes to sample! April 16, 2016: The Millet Project goes to Cal Day! We had bread made from millet for sampling, generously provided by the New Bread Company. We had millet seedlings to give away, and full grown plants to show off. August 28th 2015: Article about the Millet Project online on the Berkeley news site! 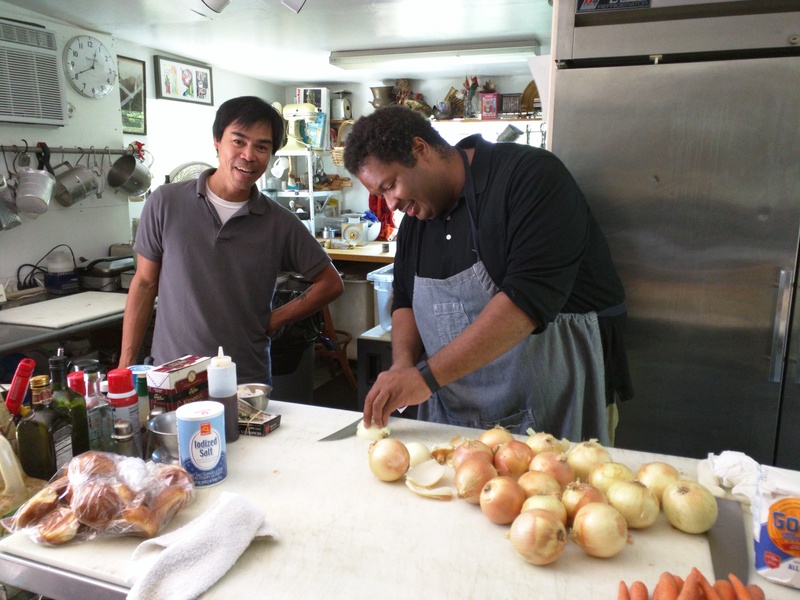 August 20th 2015: Burgers with Millet Patties – trial with our Millet Exhibit cooks Rommel Batu and Pierre Bellevue! August 4th 2015: Second Proso millet planting at the Gill Tract farm. July 24th 2015: Pedro Gonçalves joins the Millet Project team! July 19th 2015: First big-scale cooking session in preparation for the Millet Exhibit! June 25th 2015: Amrita, Patricia and friends weed the millet rows at the Gill Tract farm. Tom Carlson from Berkeley Open Source Food helps with identification of “weeds” and finds tons of edibles! June 20th 2015: Our brewmasters Matt and Liz Youngblut take on an exciting challenge: the brewing of the first batch of millet beer. We are excited to be serving it at our exhibit on 08/30/2015! May 19th 2015: Amrita, Patricia and Elisabeth plant their millets at the UC Gill Tract Community farm in Albany with their own hands. April 26th 2015: Amrita and Rabin visited Healdsburg to meet Lou Preston and his colleagues and see the millet planting plot at the Preston Vineyards. April 21st 2015: Patricia and Gavin visited Ukiah, CA to help Mai and Julia sow the millets. March 23rd 2015: Patricia and Amrita ship out the seeds, and we are very excited about embarking upon this millet growing and exploration journey! March 20th 2015: We received 50 lb each of White Proso Millet, Hybrid Pearl Millet, German/ Foxtail Millet and 10 lb of Japanese Millet in the mail from Albert Lea Seeds! We are excited to plant some millets at the Berkeley Gill Tract Community Farm and ship out the seeds to our collaborators – Mickey Murch of the Gospel Flat Farm, Doug Mosel of the Mendocino Grain Project, Lou Preston of the Preston Vineyards, and Mai Nguyen. March 18th and March 20th 2015: The UC Berkeley team finally meets! Gavin, Patricia, Sarah, Peggy and Amrita finally have a rendevous! It was about time. Nov 7th 2014: Meeting with Ann Thrupp, Executive Director of the Berkeley Food Institute. Ann reviewed some of our ideas, and told us that it was right along the track of what the BFI was looking to fund, however, we needed more cross-disciplinary collaborators! Nov 5th 2014: Meeting with Peggy Lemaux. We discussed about our common passions of responsible science, our goals as scientists, and the Berkeley Food Institute Seed grant. Peggy showed me her beautiful basket of dried millet ears that she had received from a visiting farmer. We had a fantastic brainstorming session about the proposal. Oct 15th 2014: Amrita meets Sheila McCormick and shows her the Traditional Grains Cereal Bar idea that she submitted to the National Geographic Expedition Granted. Amrita wants to apply for the Berkeley Food Institute‘s (BFI) Seed Grant 2015 with an idea to grow traditional grains such as millets locally in California, and then make them available to consumers. Sheila advises Amrita to meet with Peggy Lemaux, a Co-operative Extension specialist at UC Berkeley and Sarah Hake, Center Director of the Plant Gene Expression Center.